Could ambitious financial regulation be a key driver of climate action? With the carbon costs of travel in mind, Climate Innovation Summit session summaries are available online for those who cannot attend—and for review for those present. These summaries aim to extract the key debates, dialogues, and learnings from each #MissionFinance session. Richard Bruton, Minister for Communications, Climate Action and the Environment, Government of Ireland, delivered a keynote—“Mission Finance and the UN Financial Centres for Sustainability—What does being a transformative green centre mean?”—preceding a panel on sustainable finance at the Climate Innovation Summit, and described Ireland’s ambition to “move from a follower to a leader” of climate action. He cited global mobilisation on financial solutions following the Great Recession of 2007-2009 as an example and urged that we have the same decisive approach on climate finance. Ireland faces its own specific climate challenges, for example, its housing stock uses 58 per cent more energy than the rest of Europe and €50 billion is needed in the next 20 years to make Irish housing energy efficient. The Irish government has less than five billion to contribute. 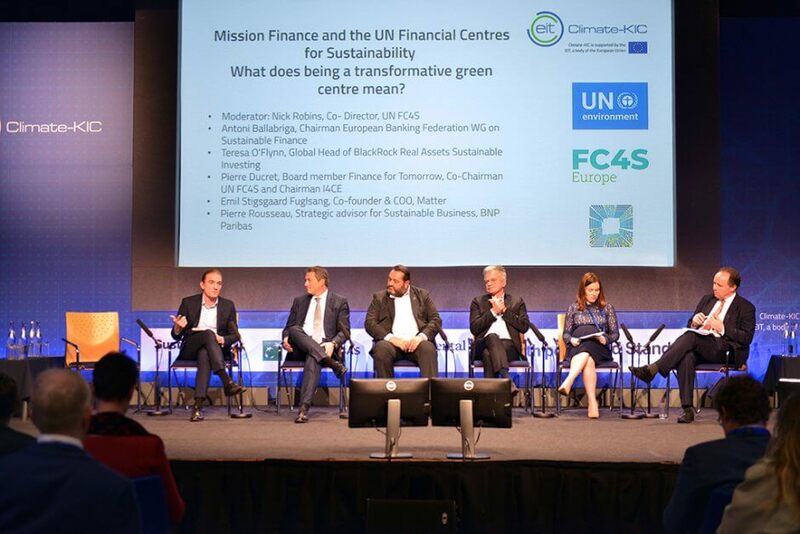 On the other hand, Bruton identified a growing appetite for green finance, stating that the first Irish green bond was just launched and it was many times oversubscribed. With that, the panel discussion, “Unlocking the Trillons,” was introduced. The speakers were: Nick Robins, Co-Director, UN International Network of Financial Centres for Sustainability, Teresa O’Flynn, Global Head of BlackRock Real Assets Sustainable Investing, Pierre Ducret, Board member Finance for Tomorrow, Co-Chairman UN FC4S and Chairman I4CE, Antoni Ballabriga, Chairman, European Banking Federation Working Group on Sustainable Finance, Stephane Boujnah, CEO and Chairman of Euronext, Emil Stigsgaard Fuglsang, Co-founder & COO, Matter, and Pierre Rousseau, Strategic advisor for Sustainable Business, BNP Paribas. O’Flynn began with an interesting insight into BlackRock’s particular approach, which aligns climate ambition with the lowest cost capital available: Institutional capital. “BlackRock has built up one of the largest private level investment vehicles for the renewables market. Cash flows are driven by the sun shining and the wind blowing, not by what’s happening in stock markets, which is big advantage,” she said. O’Flynn described the problem space, saying buildings account for 20-30 per cent of emissions and 60 per cent of buildings we have today will be here in 2020. New buildings must be energy efficient and retrofitting is more difficult to do, she cautioned. This point dovetailed nicely into Stigsgaard’s work with Matter. The startup works with pensions and sustainability. Considering 40-50 per cent of stocks in the world are owned by pensions, the opportunity is massive. “We’re trying to connect people to their pensions. Aligned with pension companies, we create a pension fund and show people the impact of their money. Our approach is about divestment and inclusion,” said Stigsgaard. Ducret affirmed this point and said that we will need new regulations to accelerate the greening of the whole finance industry. When we talk about top-down regulation, he said, it creates a huge debate. Yet, Ducret hopes for—and can conceive of—accelerated action coming from regulators. “The climate issue is on the table and it’s going to increase in the coming years,” he said. Stigsgaard provided an example of how these regulations might look: “How about rules requiring all issuers of savings products to disclose climate impact?” He left the audience to ponder a compelling point—that we’ve seen strict EU data protection regulations with GDPR, so why can’t we implement environmental regulations with the same level of ambition?